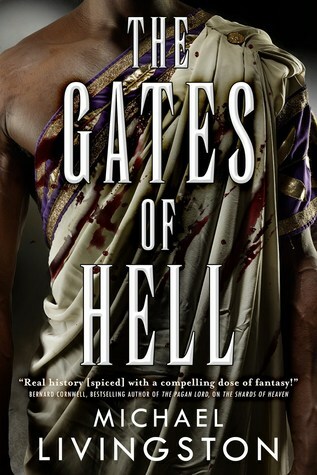 As the second volume in a historical fantasy series about Ancient Rome, The Gates of Hell can be viewed as the “next chapter” of the events following the Final War of the Roman Republic. Approximately five years have passed since Alexandria fell. Marc Antony and Cleopatra are dead. Their daughter Selene has been taken into their conqueror’s household, becoming one of Augustus Caesar’s adopted children. But for all that, she knows she is still a hostage and the longing for avenging her parents still burns inside. The book begins with Selene taking matters into her own hands, seeking her own Shard of Heaven after finding out about the godlike abilities they can grant to the people who wield them. She manages to find and obtain one disguised as a statue in the Temple of the Vestals, bringing another of one these powerful artifacts into play. Meanwhile, her arranged marriage to Juba of Numidia, an adopted son of Julius Caesar, ultimately grew into to be a relationship based on love and respect. Together with her husband, who also possesses a Shard of Heaven, they begin to experiment and practice with their artifacts, learning how to harness their power. At the same time in another place, a secret group of guardians are in the act of securing the Ark of the Covenant, rumored to be the most powerful Shard of all. Former legion soldier Lucius Vorenus decides to travel to Library of Alexandria to meet with the Head Librarian to discuss certain theories they’ve developed about the holy Ark. Unknowingly, he attracts the attention of a disgraced astrologer named Thrasyllus, putting all that vital information into the hands of a desperate man who knows Augustus Caesar will do anything to know the location of another Shard of Heaven. Whether our characters are driven by love or greed, faith or revenge, all their actions culminate into a harrowing conclusion that spells a threat to come for everyone. Like the previous book, The Gates of Hell was another great read. While it does have the distinct feel of a “middle book”, it comes without the baggage normally associated with one. Pacing is dynamic and swift, and perhaps even a bit too brisk in some places when all I wanted to do was bask in the atmosphere of the setting a little while longer. Like I wrote in my review of The Shards of Heaven, the author has an extraordinary talent for evoking the time period. The people, places and events surrounding the Ancient Roman Empire have always fascinated me, but I don’t consider myself an expert and need the historical background or details in the narrative from time to time. In that respect, I find Livingston’s writing and storytelling style to be very readable; even someone with just the bare knowledge of the subject matter can enjoy this novel, because of the perfect balance he strikes when injecting history into his fiction and vice versa. I also thought it was really interesting how almost every character was based on a real figure or an account of them in the historical record, and in many cases I only found out after reading the glossary at the end of the book. Livingston offered enough historical detail without overwhelming the reader, and to be honest, could have afforded to give more if he had wanted to. Then there are the characters. Selene, a personal favorite (both in this book and in written history) is back with a bigger role in this sequel, carrying on her mother’s memory and legacy. She has been adopted into the family of Octavian/Augustus Caesar, but there’s no love lost there. She was also made to marry Juba, though to her surprise she grows to love him. The two of them bond over their shared experiences of having their parents and homelands conquered by Rome, but Juba still has mixed feelings towards Octavian, his brother by adoption. There are some incredibly complex emotions surrounding these characters, and with those, the reader might start to see Octavian from a whole different perspective. My only criticism is that Selene, Juba, and Octavian might have been portrayed a little too well, with the result being that some of the supporting characters, including Thrasyllus and Vorenus, were overshadowed. Also, without giving away too much of the story, some parts were predictable in the sense that we were repeatedly told over and over how “in love” a certain couple was, which we all know is code for “something bad will happen.” As such, when the other shoe dropped, there were no surprises. As a follow-up to Michael Livingston’s fantastic debut though, The Gates of Hell carries this series incredibly well. Everything that worked in The Shards of Heaven is back here in this sequel, including compelling history, powerful storytelling, and engaging characters. There’s some great set-up for the next novel, and I can’t wait to read it. I feel like I need more! Though I have to say this is one of the more interesting portrayals of Selene I’ve ever seen. The other books I’ve read about her (Lily of the Nile and Cleopatra’s Daughter) were pretty much straight up historical fic though. …Yep, this reminds me I really do want to get my hands on the first book! Haha. Your review here has done a perfect job of reminding me why I need to read the first book in the series 😀 It really sounds like a story I’d enjoy! I can’t wait to read this one – soon – I’ve skipped your review a bit until I’ve read but glad to see you enjoyed it and are keen to get to the next. I am planning to buy the series as I am a fan of the Roman culture and theme. Luckily, found your reviews and the cover of the new one. This particular review reminds me strongly of the TV series Rome. Thanks, Mogsy. Your name is adorable by the way. And if you enjoy historical fantasy (and the Rome TV series!) then yes, you should check out this series! I love his take on blending fantasy elements with real people, places, and events.